Our pilgrims had very little sleep last night! After participating in the Orthodox Easter night service, they got up on Sunday morning either for Mass at the Catholic Church of St Louis des Français, presided by Archbishop Pezzi, or for the Eucharist at the Anglican Church, which warmly welcomed those from different Protestant backgrounds. In that way, the pilgrims were able to make their Easter communion. And then we moved on to Christ the Saviour Cathedral for the Solemn Vespers with Patriarch Kirill. 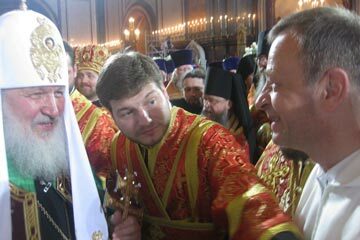 At this service the Patriarch receives the Easter greetings of the bishop and clergy of the Moscow diocese. Completed in 1860, destroyed by Stalin’s regime in 1931, rebuilt fully in 2000, the cathedral really is a symbol of the rebirth of the Russian Church. The Cathedral was crammed full. The priests entered first, then the bishops and finally the Patriarch. Beautiful choirs sang out the Easter hymns, which the congregation joined in with fervour. The Easter vespers are short, but the overflowing joy is still very much apparent. The Gospel of Saint John, with the meeting of the Risen Christ with Thomas, was read. The Patriarch preached on how even if we cannot see the Lord physically, we can experience his presence in prayer and in our life together. He then went on to speak to the priests about how they are to embody that presence and to pay a particular attention to the new generation of young people. Their life experience is so different from that of the priests. They have never experienced life in a society that has banished faith. "We must help young people to see and understand the spiritual perspective of life; we must help them to feel the beauty and power of faith that can change people’s lives. The younger generation should know that the Church is not only beautiful ceremonies, is not only a shining robe. The Church is a community of people who are being saved by God, this is the place where a person comes into direct contact with God and from God finds great strength to live according to God’s truth." And then we brothers were led to greet the Patriarch in the name of the young people. 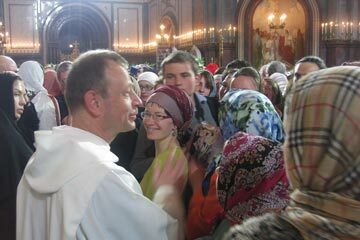 He received us very warmly and expressed his joy at the presence of the 240 pilgrims. 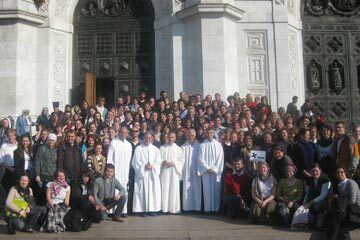 Afterwards, we gathered with the young people on the steps of the Cathedral. So many smiling faces, so many grateful hearts. Br Alois spoke to them about taking to heart the words of the Patriarch. They are a generation who are called to commit themselves in their churches. The experience of sharing these days with the Orthodox parishes is an experience of strengthening of faith in order to continue the pilgrimage. Later, a lady from one of the parishes, whom I didn’t know, called to say thank you for sending a young woman from Hamburg to stay with her. It had been a time of real blessing for her. I have the feeling that these have been days of mutual enrichment and that our pilgrimage is not ending, but moving on to its next stage. Today, the pilgrims have left. We really have to pay tribute to them because they entered so fully into the spirit of the pilgrimage. By respecting the Orthodox tradition of their host parishes, they gained the respect of the parishioners who understood that they were not there simply to observe but to pray, seek and learn. Pilgrims come with empty hands to receive what God wants to give them. But those hands were filled during these days – there is no doubt about that. And their presence leaves traces in the hearts of those who welcomed them and in the lives of the parishes where they took part in the rich celebrations of the Russian Orthodox Church during Holy Week and Easter.